Utilizing nearly 60 years of combined winemaking experience heading up premium wineries throughout Santa Barbara and San Luis Obispo counties, Bruno D’Alfonso, and Kris Curran now focus exclusively on their own brands. Today the DC Team craft their wines under four different labels. Scroll down the page to see all of the wines currently available for purchase. 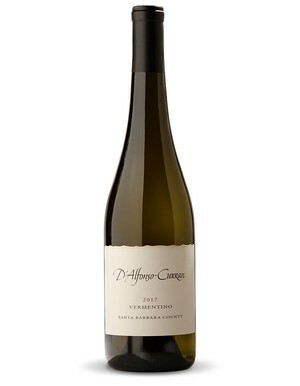 Shop D'Alfonso-Curran WinesOur D’Alfonso-Curran brand was started in 2006 with the concept of showcasing ultra-premium, vineyard-designated Pinot Noirs and Chardonnays from the Sta. Rita Hills AVA and top vineyards in Santa Barbara County. We have recently added a new line up of rare, white wines, which are highly aromatic and fruity, yet "bone-dry". Shop Curran WinesOur Curran label, which was the first label Kris established in 1997, concentrates mainly on vineyard-designated Spanish varietals including: Grenache, Grenache Gris, Grenache Blanc, and Tempranillo. This label also produces exceptional Pinot Noir, Chardonnay and Syrah. Shop Di Bruno WinesDi Bruno was the first brand from the DC Wines portfolio which was founded in 1995 and celebrates Bruno D’Alfonso’s Italian heritage. Italian red and white varietals are crafted under this label including: Pinot Grigio, Sangiovese, Nebbiolo, and Merlot. Shop Badge WinesStarted in 2003, BADGE features premium wines from various vineyards throughout Santa Barbara County. BADGE is currently producing Pinot Noirs, a Stainless Steel, non Malo-Lactic Chardonnays, and Syrahs.